The second panel at the IMTFI annual conference was moderated by Scott Mainwaring who was introduced by Bill Maurer as one of the founding members of the IMTFI and a person who had very quickly understood that the big questions about mobile money might be less about security and encryption and more about social practice and the work he was doing at Intel labs. Maurer reminisced about the Everyday Digital Money Workshop as one of the originary events of field-building before the IMTFI was actually funded. Mainwaring is also one of the directors of the Intel Science & Technology Center for Social Computing. The presentations in Mainwaring's panel tended to emphasize the role of material culture in mobile money practices and the importance of space and place in situated lived experience. Martineau used photographs of the households to dramatize the variety of containers, baskets, and bags that were part of the management of an individual house that included rooms for electrical repair, shop services, and a son's bedroom. She described how a bill might be suspended from the ceiling to indicate an urgent need for prompt payment and how savings might be buried under rags. These systems for display and secrecy highlight how houses themselves could function as financial instruments, particularly when there might be problems with going to a bank, which could expose a household to the vulnerabilities of perceived wealth. 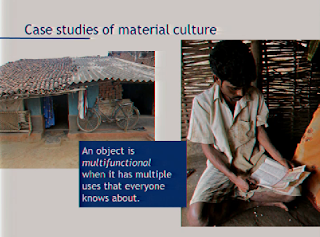 Martineau argued that houses could be tools for managing resources in a story about Orissa not as backward or traditional but as a site in which contemporary concerns were modeled and addressed, such as saving for technical college. Obscurity within the family in addition to hiding from neighbors might be important for these households as well. In these households the BPL card or “Below Poverty Line” Document was essential, given that it was a community in which only three families were above the poverty line. Researchers explained how financial redistribution schemes often involved social routines. For example loan papers for a daughter's education might require social performance, since when payments were made there was a ritual of marking papers, and other women would pay if one of the women in the loan group could not pay. In this way financial documents solidified social identification as well as a contractual function, which makes more sense to the participants as social. The researchers argued that their observations of how people manage skillfully indicated the need for a different direction from prevalent approaches in financial literacy discourse. Tonny K. Omwansa and Timothy Mwololo Waema's The Impact of Pure Mobile Microfinancing on the Poor Title of Project: "The Impact of Pure Mobile Microfinancing on the Poor opened with a video showing market activities in Kenya ranging from a banana seller examining to his wares to a woman marveling that she could now make payments in the bathroom. Omwansa and Waema focused on how such sellers were expanding business with Musoni by getting loans with "pure" if not branchless mobile micro-financing for the poor. (As researchers explained, "usoni" means "future" in the region's language.) They claimed that Musoni was the first MFI to go 100% mobile in a country in which 30 million of the country's 40 million people have mobile phones, and financial services can even be accessed in a bar. In analyzing the success of the country's financial inclusion agenda, the researchers worked with data from 245 questionnaires. In sources of loans, ROSCA loans were more common, as other researchers had found. 44% of Musoni users had been members of another MFI before, and 18% dropped other MFI providers upon switching to Musoni. Researchers also reported lower default rates with Musoni. In arguing for a "cash society moving toward cashlessness," they noted that 71% of their informants said that tracking loan and repayments is better, and 79% kept extra money as "idle" electronic money, and they were able to take advantage of other uses besides loan repayment. The emphasis on safety was apparently critical to individuals who linked their money practice to mobile phones. Woldmariam Mesfin Fikre's Mobile Money Information System Architecture for Open Air Market Title of Project: "Mobile Money Information System Architecture for Open Air Market cited work shared at the Future of Money Summit along with research by Maurer (2010), Kristof (2010), Muhammad (2010), and OECD (2002). He argued for "the need for personal technologies to manage everyday money practices" and pointed to the preliminary research done in "Designing Digital Payment Artifacts" (Olsen, Hedman, and Vatrapu 2012) as a model. He insisted that the ATM was not suitable for sparsely populated rural people in a country with 65 million Ethiopians in rural reas. He presented work based on observation, interviews, and discussions at four sites and referenced his research on markets that included fruits and vegetables, cereals, clothes, and other commodities. Using a random selection system, Fikre identified subjects with different religions, ages, educational levels, and business experiences. He found sellers making distinctions about currency based on color, size, and pictures. Sellers were also grappling with the distractions of physical space, where they wanted to be able to protect money from theft, handle money easily, identify cheaters, tell balance by sound, and do financial mathematics. Fikre lamented the fact that not enough research had been done on the format or structure of money, given the focus on the system of money itself. He argued for more field studies to develop "architectural design concepts" for money in the situation of tangible interactions.